Guaranteed for life. Now that’s something you don’t hear very often, especially when it comes to your socks. But a lifetime guarantee is exactly what you get when you purchase a pair of Darn Tough Vermont Socks. These vibrantly colored, form-fitting socks are made of fine gauge Merino wool and are uniquely designed to withstand whatever your feet put them through. 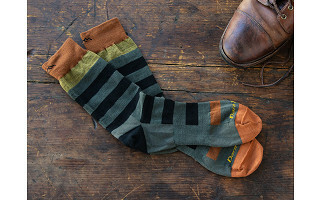 With 1441 stitches per square inch (more than any other sock on the market), Darn Tough Vermont Socks are made to last with quality and care in the Green Mountains of Vermont by Cabot Hosiery Mills, the last remaining sock manufacturer in New England. Ric Cabot, third generation owner of the mill, takes the business of socks seriously and plays a key role in testing prototypes. He doesn't just talk the talk, he walks the sock—wearing one pair for three weeks straight without a single wash to ensure it can hold up under even the most rugged conditions. These socks aren't just darn tough, they're darn comfortable. We hope that you and your feet agree. We live and work in Vermont, which means our backyard is the perfect testing ground to make the finest Premium All Weather Performance Socks. Proud of our tradition, we hope our socks are the most comfortable, durable and best fitting socks you have ever owned. And if not, we offer an unconditional lifetime guarantee. Happy to answer any questions you may have, so send them my way! I'm wondering about the feel of these socks - I find some wool (even merino) to be itchy! @Joyce I was wondering the same thing. Would like to get them for my family for Christmas but so many people are sensitive to wool. @paulette Hi Paullette, these are made with Merino wool, which basically has a longer softer fiber, so it feels wonderfully soft and silky, and Darn Tough only uses the finest gauge fibers, so it's the softest and silkiest. Why do women's sizes only go to 9.5? I'm a 10.5 sized woman and there are lots of us! @Diane Yeah, 9.5 doesn't work for lots of women! Silly. Aaron from The Grommet here. We hear you! We will be adding a larger size in the Women's collections. Stay tuned, we will be in touch when they are available! I Love these socks! They are not too thick, so I can wear them with everyday shoes. The denseness of the weave makes them very comfortable (they are a flat weave with no loose threads or bothersome seams) and strong. I seem to put a toe through ordinary socks after just a few wearings or wear through the ball and heel of socks. No sign of any wear on these after a year. These are the socks I reach for over all the others in my sock drawer. 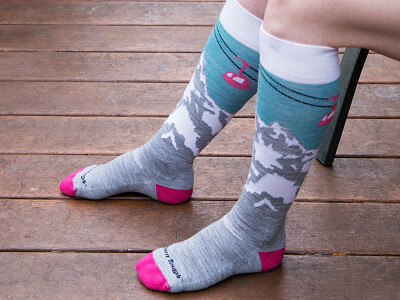 Thank you for sharing, Kamala, and thrilled to hear you enjoy the socks! Would it be possible to get your awesome ski/ride function 5 OTC padded cushion socks in just plain black? I'm curious, do people wear these without shoes? In the video it has people hiking and they don't have shoes on in some of the pictures. Only the adventurous ones! Kidding aside, the hikers in the video, and countless others, enjoy the feel of the socks so much that they are just showing them off for the camera. Since these socks are wool, I am wondering about the washing/care instructions. I'm very intrigued. Do you/will you make them in kids' sizes? Amy from The Grommet team here. I'm not certain of plans for kid's sizes right now, but that's a fantastic idea that if they haven't already considered, they now know they have some demand. I'll let Ben step in here to answer on whether there are definitive plans for this. question. i have wide feet and very heavy calves, would the ski/ride function 5 otc be suitable for me? if no, can you recommend another? I suppose it comes down to sizing and the circumference of the calf. I will follow up through email to provide more detailed dimensions of the sock. Guaranteed for life. Now that’s something you don’t hear very often, especially when it comes to your socks. But a lifetime guarantee is exactly what you get when you purchase a pair of Darn Tough Vermont Socks. 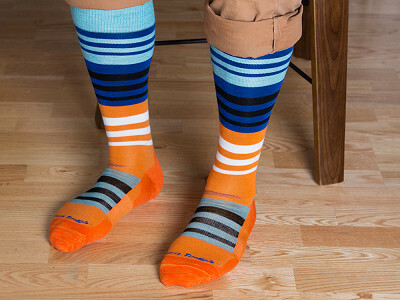 These vibrantly colored, form-fitting socks are made of fine gauge Merino wool and are uniquely designed to withstand whatever your feet put them through. 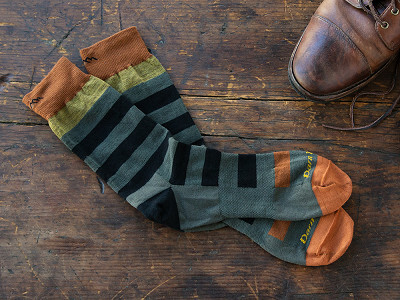 With 1441 stitches per square inch (more than any other sock on the market), Darn Tough Vermont Socks are made to last with quality and care in the Green Mountains of Vermont by Cabot Hosiery Mills, the last remaining sock manufacturer in New England. 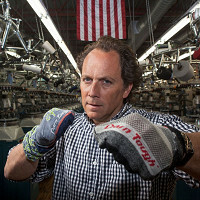 Ric Cabot, third generation owner of the mill, takes the business of socks seriously and plays a key role in testing prototypes. He doesn't just talk the talk, he walks the sock—wearing one pair for three weeks straight without a single wash to ensure it can hold up under even the most rugged conditions.